The Adams Trinity hotel is located in 28 Dame Street close to Dublin’s main tourist’s attractions, shopping and commercial districts. Shopping in Grafton Street is just a step away and the quaint little shops in Temple Bar are close by. The oldest university in Ireland Trinity College is just a minute away with its book of Kells and old library. The visitor can explore Christchurch Cathedral the burial place of Strongbow. The Cathedral dates back to 1030 and is steeped in history. The Adams Trinity Hotel offers a heartfelt welcome to all its guests. The rooms in The Adams Trinity Hotel were decorated with comfort and tranquility in mind. Each room come equipped with direct dial telephone, hairdryer, satellite TV, room safe, and trouser press and tea/coffee facilities. The Adams Trinity Hotel is famous for its food and drink and is home to three of Dublin’s best pubs and restaurants loved by locals and visitors alike. A busy day in Dublin is a sure way to work up a hearty appetite. In The Adams Trinity hotel you can delight your taste buds and rest your weary bones in the tranquil surroundings of the The Mercantile Bar and Restaurant. The Mercantile Restaurant serves delightful A La Carte Table d’hote menus every evening from 6.30 to 9.30. 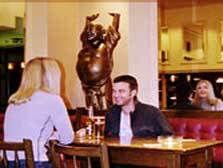 The Adams Trinity Hotel is perfectly located at the edge of Dublin’s renowned Temple Bar. Temple Bar the cultural capital is packed with restaurants, cafes, bars, clubs and galleries. 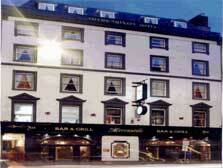 Trinity College, Grafton Street and St Stephens Green are all within walking distance.